Material handling experts MHE-Demag have launched their new Demag V-type crane designed to improve productivity for Australian manufacturing companies. Instead of promoting it through conventional methods, MHE-Demag opted to build a scaled-down but fully functional mobile version of its new crane and take it to key cities on a roadshows, thus becoming the first company in the crane industry to adopt such an innovative approach. MHE-Demag Australia Managing Director Vince Di Costanzo said the roadshow will see the crane being taken to Perth, Adelaide, Melbourne, Sydney and Brisbane. “We are using this vehicle to approach the Australian market in what is a totally new way for the equipment manufacturing industry,” said Mr Di Costanzo. “Engineering and heavy machinery companies typically face challenges in showing their potential customers the actual products before manufacturing takes place. Customers often have to finalise their buying decision based on engineering drawings or 3-dimensional images. Alternatively, customers are made to travel to the manufacturers’ premises or project sites to see the ‘real thing’. He said that in addition to having an extended service life, the V-type Crane is 17% lighter than an average conventional box-section profile girder, giving designers greater freedom in designing factories and other buildings. 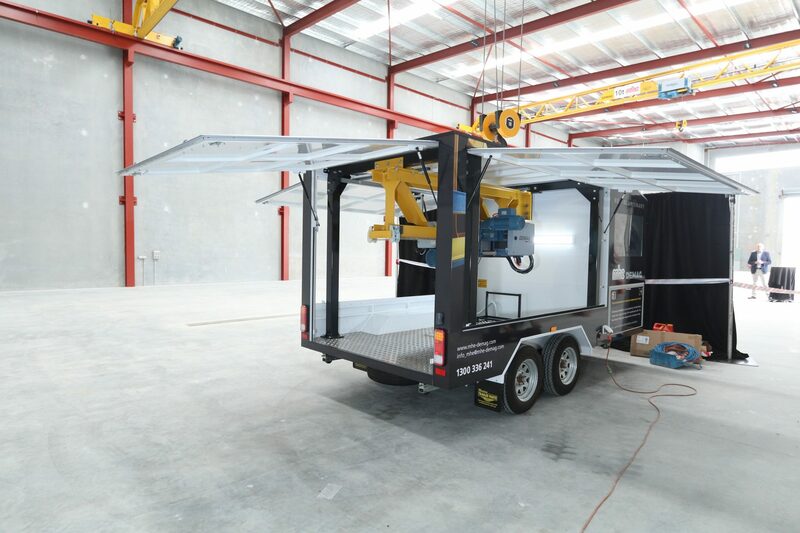 “As one of the leading manufacturers of cranes and hoists in Australia, we are extremely excited to be the only crane manufacturer who is capable of exclusively offering such advanced technology in Australia,” Mr Di Costanzo continued. He said the company was confident that their innovative crane will find applications across a number of key markets including manufacturing, steel fabrication, shipbuilding and the resource industry. “Virtually every sector is facing renewed levels of competition. To maintain their competitiveness, they need optimum efficiency throughout material flow processes. With the launch of the new Demag V-type crane, MHE-Demag is set to help our customers achieve improved productivity while reducing their overall costs,” Mr Di Costanzo concluded.